MOGADISHU – The African Union Mission in Somalia (AMISOM) is collaborating with the Somali Police Force to build capacity in the handling of sexual offences in all police stations in its Area of Responsibility in Somalia. Sixteen AMISOM police officers who are gender focal points have undergone a three-day training workshop, to learn about gender relations, the establishment of gender desks and on mentoring and assisting their Somali counterparts in handling sexual offences and addressing gender-specific needs for the people they serve. The officers have already been deployed as gender focal points in the Federal Member States. “When you look at the various activities that have to be undertaken in order to prevent or to respond to SGBV, you need police officers that are well trained in this concept,” Rex Dundun, AMISOM Police Chief of Staff and Acting Police Commissioner told participants during the official closing of the workshop. DCP Dundun urged the police officers to work closely with their Somali counterparts, strive to understand the root cause of the problem and adopt effective measures to end the suffering of victims. The training was organized by AMISOM’s Protection, Human Rights and Gender Cluster. According to Stella Maranga, AMISOM’s Gender Officer, the three-day training focused on aspects of gender sensitization, Human Rights, International Humanitarian Law; the protection of women and children, and conflict-related sexual violence, among other topics. 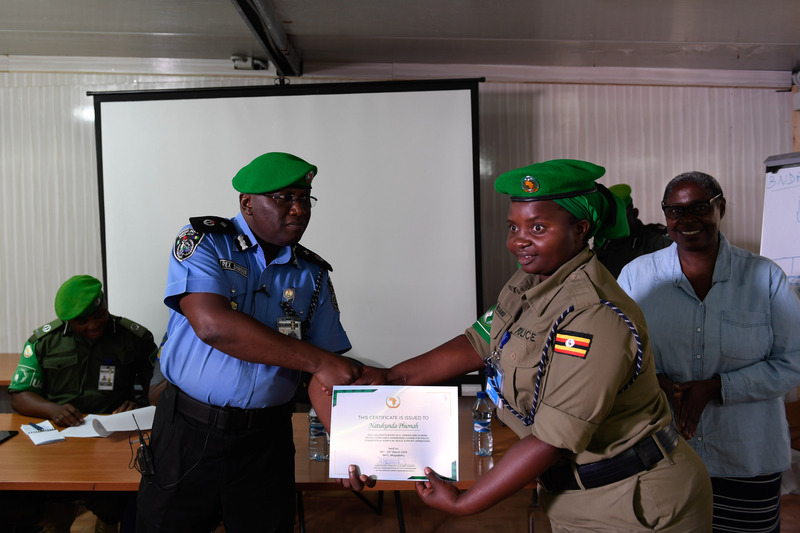 Police Inspector Racheal Malambo, a gender officer with AMISOM Police said the training had enlightened and sensitized participants on the need to respond swiftly and effectively to cases of sexual violence. “Women, children, and girls are the most vulnerable. So the training focused on how the trainees should mentor Somali police officers to respond to cases of such nature and also, how to protect the victims,” Inspector Malambo said. Police Sergeant Charles Campbell, a beneficiary of the training, said he would impart the knowledge acquired to police officers in his duty station in Jubbaland State. With the help of AMISOM Police, Jubbaland State Police has set up special gender desks in four police stations, to deal with cases of gender-based sexual violence and crimes of similar nature.